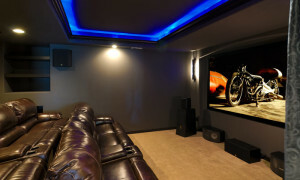 When you are designing your home theater room, don’t forget one of the most important parts-the seating! If you’re designing a dedicated home theater room, you’ll want at least a row or two of theater seats. There are many seat covering options available, from highly durable fabrics to the finest quality leathers. Most companies also offer options for drink holders and motorized reclining. We highly recommend incorporating these two. If you have children, it’s likely their friends will be coming over to use the theater and making your home the neighborhood’s hang out. Something you may want to consider if this is the case is modular seating. It’s far easier to fit 10 small kids on a big sectional than in four theater seats. When the kids get older, you can switch the sectional out for theater seats. We invite you to visit our showroom and sit in our samples of theater seating. We’re sure you will find something that fits your style and budget.